You will probably want to see at least 1 or 2 of the nighttime entertainment options during your Disney World trip, but there are some locations to view these shows that are better than others. 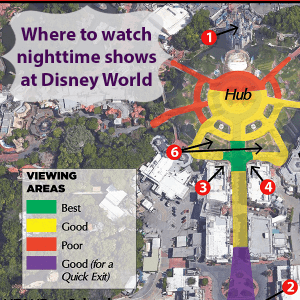 The best nighttime show and fireworks viewing spots at Disney World are not hard to snag, but they do take a little planning. Check out these tips below to help you find the perfect spot to catch all the action. Magic Kingdom fireworks are probably the best nighttime show at Disney World and often just before they begin or right after, there's a castle projection show called Once Upon a Time that's definitely worth seeing. The projections used in both shows mean you'll want to make your way closer than what you might have stood for Wishes (the former fireworks show). For the "perfect" spot, aim to be as close to the middle as you can just outside of the main Hub, and, if possible, at least as close as the Garden View area for the Tomorrowland Terrace Fireworks Party. Those who want to leave right after fireworks (which is especially useful so you can get ahead of the crowds lining up to hop on the bus, monorail, or ferry) should find a spot at the front of the park for a quick exit as soon as fireworks end. It is important to note, however, that from this location you'll likely not be able to see the projections which are a major component of the overall show. You can also view Happily Ever After from outside the parks by sitting on the beach areas of The Grand Floridian, Polynesian, Ticket and Transportation Center, and The Contemporary. Like viewing from the front of the park, you won't be able to see the projections from these locations but since these spots also pipe in the music it makes a fantastic alternate spot for people that like to avoid the heavy crowds in the park. 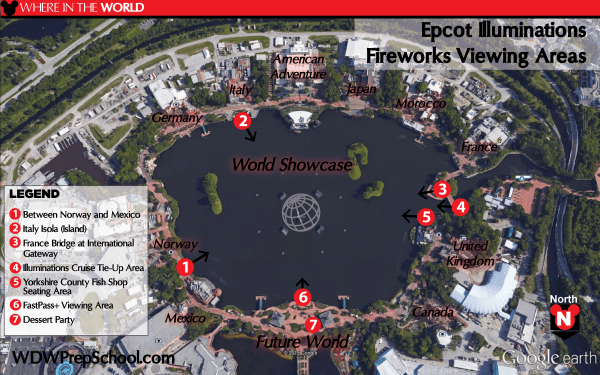 FYI: Though there used to be a FastPass+ for fireworks viewing, it went away in spring 2016. Epcot has one nighttime show, Illuminations, which takes place on the lagoon in the World Showcase area. The nice thing is that there are lots of spots available (which is why the FastPass+ and dessert party aren't recommended here), but there are a few peninsula areas that are particularly nice spots to watch from if they aren't closed off for private events. There's a lot of smoke in the air during and after Illuminations and the wind direction determines which way it goes, but it often blows toward the France/UK pavilions. People wanting to avoid that should consider spots on the Norway/Italy side of the lagoon. Hollywood Studios has a nighttime show called Fantasmic which takes place in its own theater. 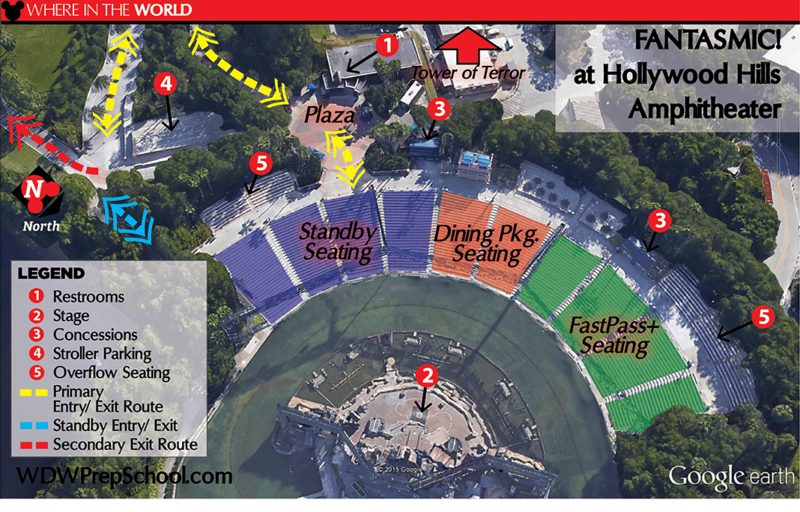 People who book the Fantasmic Dinner Package will be seated in the middle sections, with FastPass+ and standby on either side of that. Sit toward the middle or back for the best views (and to avoid getting wet). 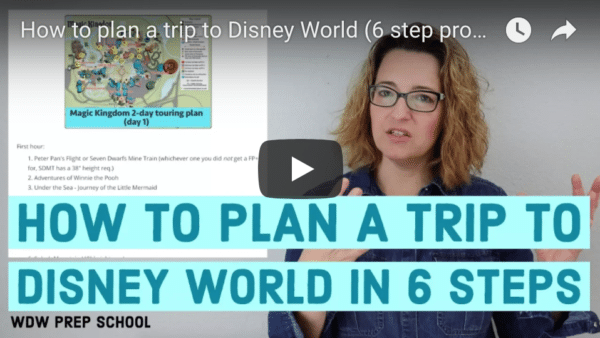 Get more Fantasmic tips and tricks. Hollywood Studios also has fireworks scheduled regularly now, and the best view of that is from near the Chinese Theater. 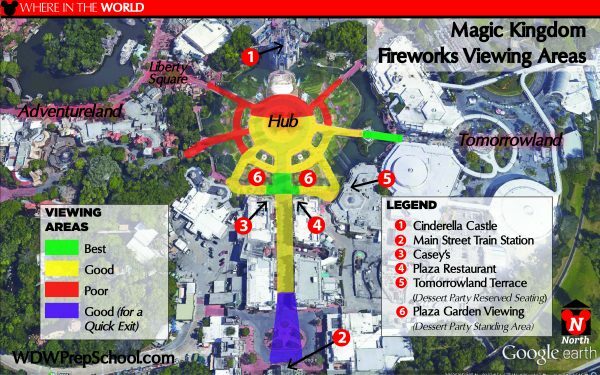 The current show involves projections and pyrotechnic effects in addition to the fireworks, so in order to get the full effect you will need to to be in front of the projection towers labeled on the map below. Since it's not a large area, your best bet is to find a spot about 45 minutes beforehand. Once you pick a viewing location, members of your party can come and go to use the restroom, get snacks, etc. Animal Kingdom has a nighttime show called Rivers of Light. Seating is very limited, but you can see the different sections in the graphic below. Get more Rivers of Light tips and tricks. The larger your group (and the more room you'll need) the earlier you'll want to find a spot. It's much easier for 2 people to find a spot than it is for a family of 10, so plan accordingly. After the fireworks or nighttime show ends, sometimes it's easier to make your way to the side (or to a park bench if one is available!) and let the crowds disperse a bit before trying to head out. The crush of people can be overwhelming to some people and navigating with a stroller when tired guests are walking shoulder to shoulder isn't much fun. If there are multiple shows scheduled for the same night (which is sometimes the case for shows like Fantasmic and Rivers or Light), the second show is almost always less crowded. Fantasmic and Rivers of Light both have dining package options that cost just a few dollars more than you'd normally pay but give you reserved seating for the show. Both are also on the Dining Plan and are a fantastic value. Happily Ever After, Illuminations, and Star Wars: a Galactic Spectacular all have dessert party options which can help you snag a prime viewing location without having to stake one out in advance. If you are considering trying one of the dessert parties, check out this comparison to see which would be best fit for your family. Spoiler alert: the Star Wars dessert party gives you fantastic value and one of the best nighttime show and fireworks viewing spots at Disney World and the Fireworks Dessert Party with Plaza Garden View provides an excellent and significantly less crowded location for the fireworks at Magic Kingdom. Want to dine while you catch the nighttime shows? You can do that from a few locations around the parks, but not all views are equal so be sure to check out your best options. Any other thoughts or comments on finding the best nighttime show and fireworks viewing spots at Disney World? Be sure to leave them in the comments. What time do they start blocking off the flow of traffic around Cinderella’s Castle for the fireworks? Where is the best spot to watch Happily ever after with toddlers? Can you see Star Wars at 8pm, then get to Epcot to watch Illuminations at 9pm? It’s about a 15 minute walk from HS to Epcot, so if you walk briskly, you shouldn’t have any trouble. I have a question that I see was previously asked, but I don’t see a response. Can Fantastic and Star Wars fireworks be seen on the same night? I would consider purchasing a desert package for Star Wars if we can get to the ‘spot’ after Fantastic. Most of the times, no. If they are scheduled close together, you basically have to choose which you’d like to see. We were lucky enough to be riding 7 dwarfs Mine Train when the fireworks were going off. Very cool view. Also caught a great view from Crystal Palace after dinner. Hello. I only see the Star Wars galactic fireworks until end of April. DO you know if May and on will still have them nightly? Can you see fireworks at HS from outside the park? Doesn’t have to be a perfect view, we just figured out night we would take the kids on a lap around the boardwalk and was curious if we’d be able to see any of the fireworks if we went towards the entrance (or anywhere else). thanks! what time do the firework and nighttime starts? The schedule varies by day. You have to check the schedule for your trip dates. Hi, Shannon! Will Rivers of Light and Animal Kingdom’s other nighttime activities still be going on in late September? Hi!!! Love your site, been using it for ages to try and plan our vaca – you rock! My cousin mentioned at WDL there is a restaurant you can make reservations at that after you eat you get to go outside to a special area to view the parade (like priority saved seating). I have been searching around but can’t find that here, and wondered if this is available in WDW? Where at the Contemporary do you sit to see the fireworks? We are first timers with young toddlers so this could be a great option… Especially since I don’t want to take the kids to California Grill! If I stand between the DHS entrance gate and the lakeshore during Symphony in the Stars, will I be able to hear the music there? I just wanted to say a huge thanks for sharing your maps with us! I am putting them in my binder as soon as I am done typing this! Any spots you are aware of at the Beach Club or Boardwalk that are nice places to see Epcot’s show? Does Tinker Bell still fly before the fireworks? Where would be the best spot to view her? My daughter tried to see her several years ago but missed her. Could you see her from the terrace dessert party? Yes, in fact she flies right over your head and lands on the roof top of Tomorrow Land Terrace. It’s quick (too quick for pictures I found out) but really cool to see her up close. Hi, love your blog. Just a tiny correction, the legend in MK map says “Cinderella´s castle”, the correct is “Cinderella Castle”, no ” ‘s “. Thanks and keep up giving us these wonderful hints. We will be in Disney the week leading up to July 4th but not staying on property. We will still be in Orlando for the 4th. Wondering where to see fireworks from outside The World? Do you have any recommendations for the Electrical Water Pageant? I am not sure that I have ever seen it and would like to when we go in April! You can view the Electrical Water Pageant from: the beaches at The Polynesian and The Grand Floridian @ around 9:00, Wilderness Lodge boat dock @ around 9:30, Ft. Wilderness beach/marina @ around 9:45 and the Contemporary (watch from beach on the Bay Lake side) a few minutes after 10 p.m. each night. Hi Heather! I read somewhere else that the beach area at the Polynesian is now restricted to guests staying there. . . do you think that will be the case in late September? I was looking forward to a dole whip while the parade went by! My daughter and I usually catch the water pageant as we come into Magic Kingdom late for extra magic hours. We can see it from the area right before you check your bags as you go into MK. I guess you could see the pageant as you leave the park at that time too! 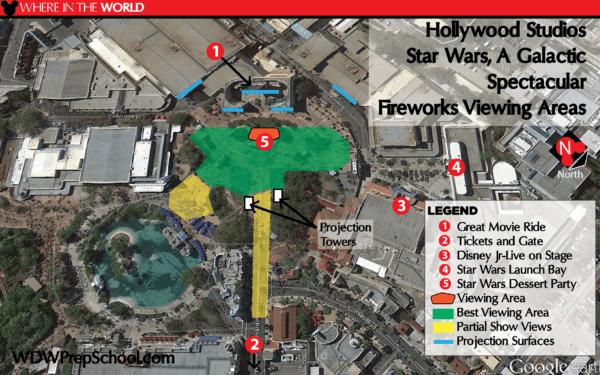 In your Hollywood sSudios fireworks map, you show Playhouse Disney. It hasn’t been there since 2011, being replaced by Disney Junior Live on Stage. Many of your readers have children fitting that demographic (toddlers /preschoolers ), so that reference would be quite outdated to them, as I’m sure many of them were born after the changeover. Is the Fantasyland label on the map for the Electrical Parade a mistake? Or am I looking at the map incorrectly? Yep – it was a mistake! It should be fixed now. I have heard that sitting at the Sleepy Hollow eatery is a good place to view the fireworks at the Magic Kingdom, but that appears to be in your red zone. What are your thoughts on that specific location? Sleepy Hollow can be a good location for viewing the Main Street Electrical Parade if you get there early and snag a spot by the rail. Its not such a great spot for fireworks, though. You’re at a funky angle from that vantage point and there are lots of trees that can block your view.